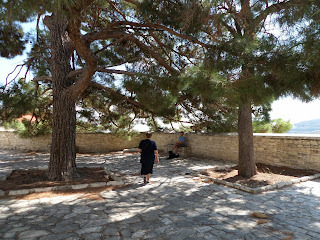 We had passed through Lefkara some time during early Spring this year, amid a torrential downpour, and decided to stay in the car. So while looking for mother-in-law-friendly days out recently, I took the opportunity to go back for a better look. Of course, Sage came along too. We loved it. Despite being a bit of a tourist trap, Lefkara is a really beautiful village. There were a couple of tourist groups while we were there, in late September, but it wasn't too busy. 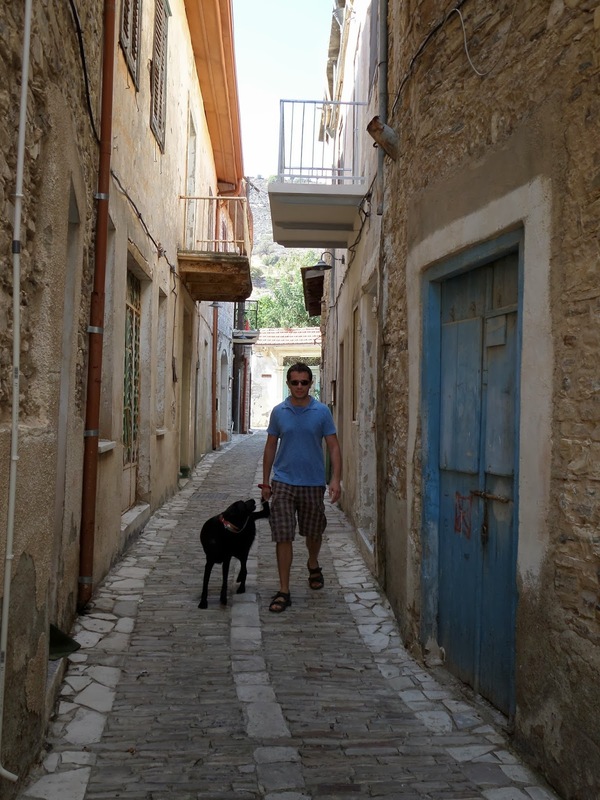 Being up in the mountains, Lefkara is a bit cooler than down on the coast. From the upper village - Pano Lefkara - you have great views of the red tiled roofs of the lower village, and the surrounding mountains and agricultural land. 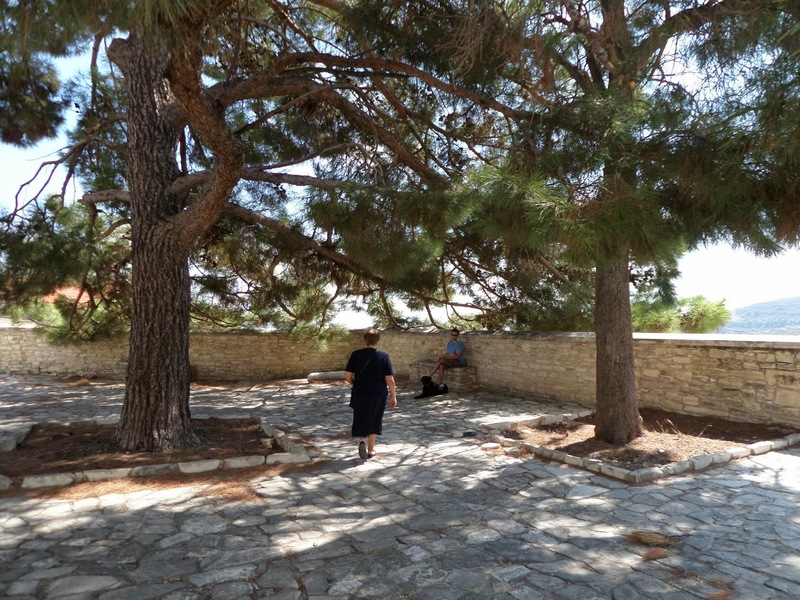 A good, shady resting/viewing spot can be found next to the church of the Holy Cross at the lower end of the village. I loved the architecture preserved in this village. 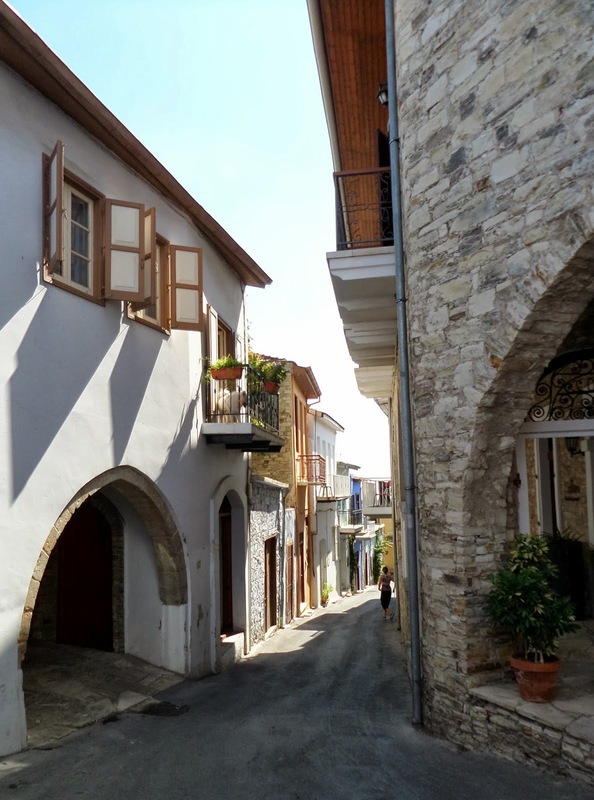 There are some beautifully restored stone buildings, (many are heritage protected buildings restored by the Department of Antiquities of Cyprus), with balconies overlooking the narrow streets and shops below. Almost every house had flowers outside, or trailing from the balconies. And almost every street you look down has small archways - kamares - joining the houses on either side. 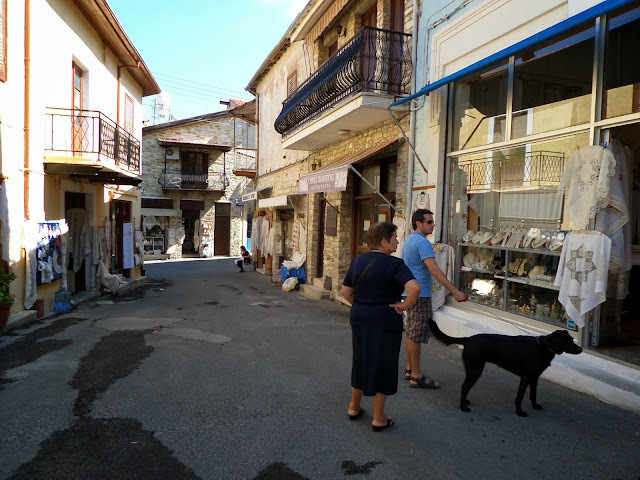 Navigating your way past the numerous shops selling locally made lace is a bit of a struggle. We were 'invited' into about 5 shops in our first 5 minutes there. But they weren't too pushy, and we made our way with smiles and excuses. We did do some shopping later, they sell beautiful hand croqueted table cloths, wall hangings etc, all made by women who live in and around the village who keep the skills and tradition alive. The lace is quite expensive, 40-50 Euros for a small lace cloth (approx. 30 x 50cm), but considering the hours that go into producing each piece, it's not actually that much. It's also important to support these small industries; as fewer and fewer young people learn these skills, it will soon stop being a part of everyday life in the villages. In keeping with the traditions of the area, there is also a workshop processing beeswax, and many of the shops sell traditional, homemade sweets and preserves. We tried a kind of 'patty' made from figs and nuts - which I recommend! 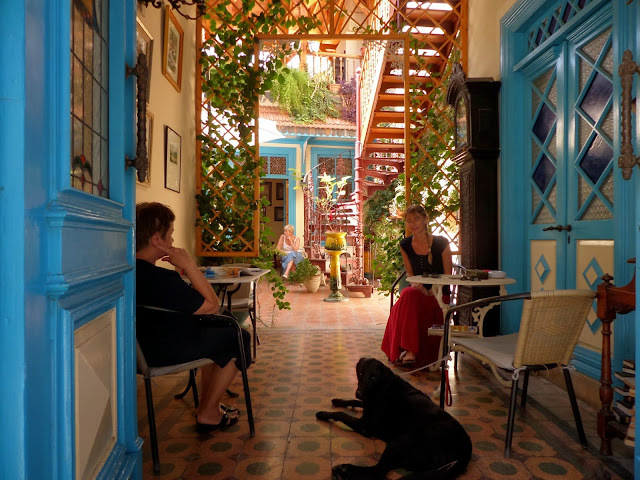 Wandering through Lefkara, and peering into aromatic, half-hidden courtyards and doorways, we happened across a cafe that pulled me in like a magnet. 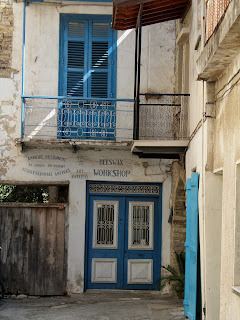 In the centre of the village is Tasties Cafe, which has to be the most beautiful cafe I have seen in Cyprus. They welcomed us warmly, with Sage, and the owner immediately offered to bring her a bowl with some water. We got chatting, and she told me she is actually a cat lover...but I won't hold that against her. The owners had relocated from the UK, where they owned an antique shop, and opened Tasties a couple of months ago (July 2013). A love of antiques and interesting decoration is evident everywhere, from the exquisite wrought iron curving staircase, to the decorating magazines left out for customers to read while they drink their coffee. Attention to detail is even evident in the bathroom, which feels like the bathroom of a stately home, complete with bath tub and soft plush towels! In the front section of the cafe are comfortable chairs, books, chess boards, backgammon etc, everything you need to while away a Sunday morning, or any other morning, or afternoon really. 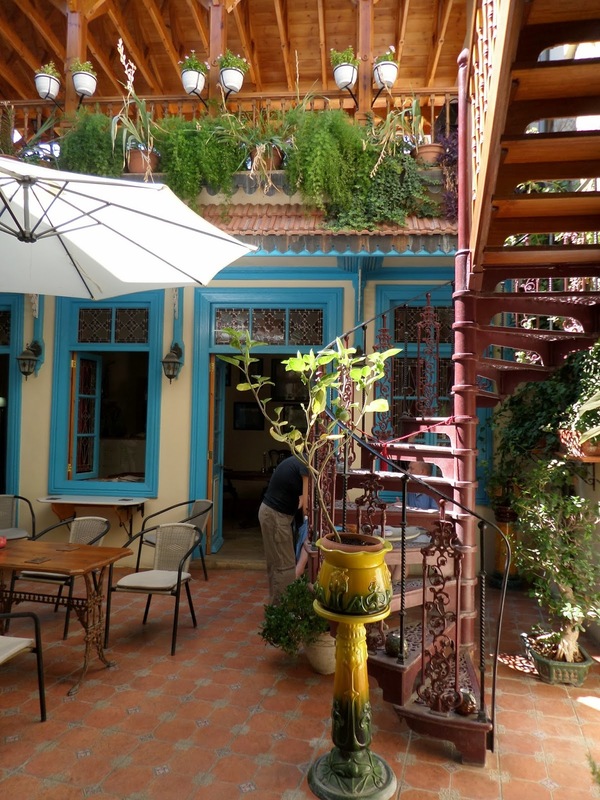 I learned that during the winter they plan to have live music events, such as jazz evenings, in the heated courtyard, and that pets would be welcome then too! 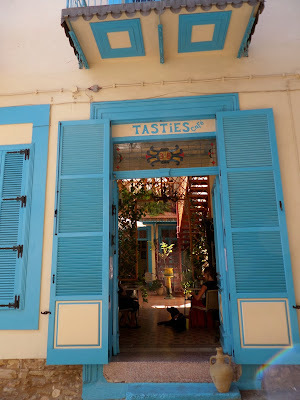 They are on Facebook: https://www.facebook.com/pages/Tasties-Cafe/408981992553270 and will post future events there.